Hi! My name is Madeleine Daugherty, and I am originally from Grants, New Mexico. I have been working for the Admissions office since 2009, and am so excited to now be one of the Admissions Advisors! I received both my B.A. and M.A. in Art History from New Mexico State University, and have had such a wonderful experience with this institution. 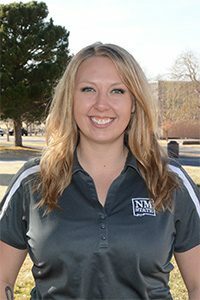 As you will learn, NMSU is a place where you will be surrounded by a great and caring community that truly supports and believes in your dreams for the future.